Looking for a great gift for your sweetheart this Valentine's Day? Grab this, some chocolates, flowers, and a card and you have a complete gift. Throw in dinner and a movie to make it even more special. OK now that I am done dreaming. I can tell you just how great this little spa kit is. 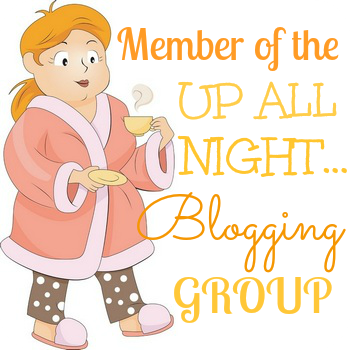 You have Seas Salts for the bath, body scrub for your skin, and then thick creamy body butter to slather your body with after you have scrub a dubbed up. Love the bag that this comes in and if you want you can add on the mud mask which you can find here. Love this set, perfect gift if you ask me. You can find this spa kit on Amazon. 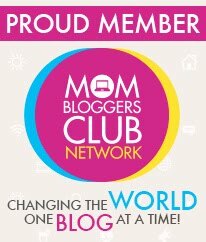 What reNeu has to say about their product. 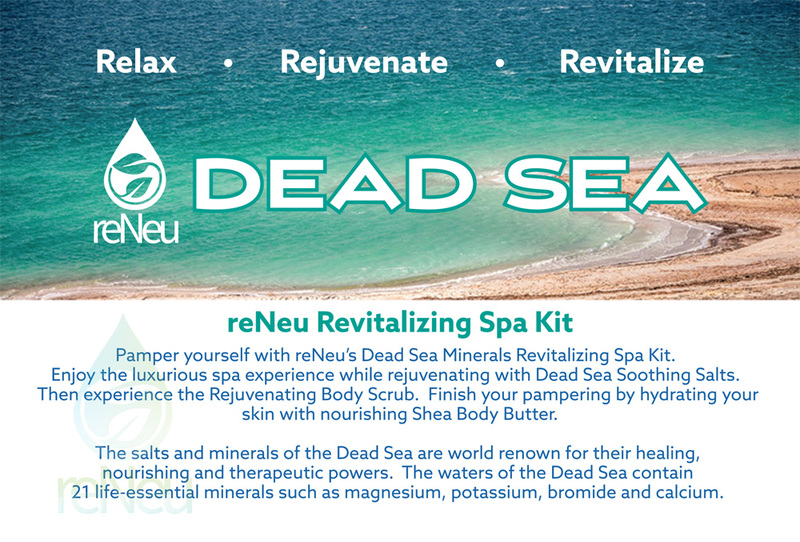 Pamper yourself with reNeu's Dead Sea Minerals Revitalizing Spa Kit. 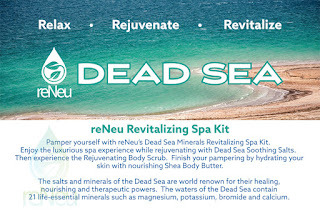 Enjoy the luxurious experience while rejuvenating with Dead Sea Soothing Salts. Then experience the Rejuvenating Body Scrub. 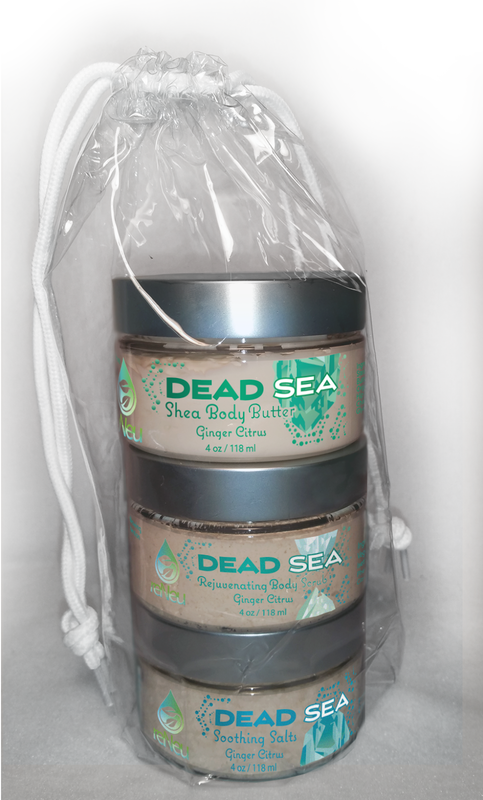 Finish your pampering by hydrating your skin with nourishing Shea Body butter. 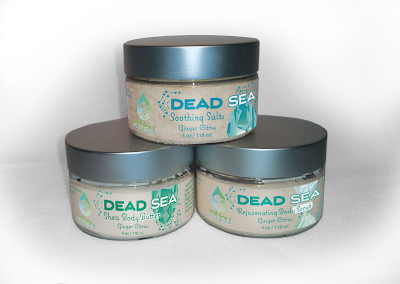 DEAD SEA SOOTHING SALTS: Contain unique natural blend of Bromide, Sulphates, and Calcium as well as Carnalite, a combination of Potassium and Magnesium that doubles salt in one crystal. This exclusive formula absorbs quickly, infusing skin with revitalizing minerals leaving the body glowing and smooth. REJUVENATING BODY SCRUB: Dead Sea Body Scrub is a non-oily creamy scrub that cleanses, exfoliates, and moisturizes the skin. Enriched with Dead Sea Minerals, plant extracts and natural oils, it will soften the skin and provide nutrients for the skin that will help it to be smoother, silkier, healthier, and more youthful. 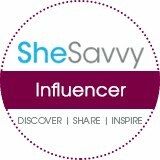 SHEA BODY BUTTER: Shea Body Butter is a luxurious moisturizer that softens and hydrates skin with the natural benefits of Shea, Aloe, Calendula and Chamomile extracts.